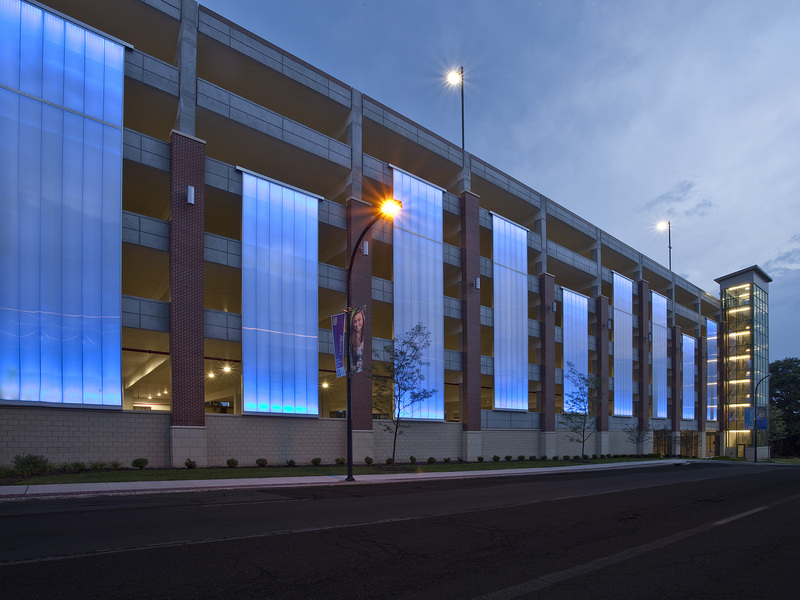 Using LED light boxes to illuminate 14,500 sq-ft of CPI Daylighting’s Pentaglas® panels covering a new five-story parking garage, the Akron Children’s Hospital hopes to heal through color. Akron Children’s Hospital at night with blue LED lighting. “The panels have helped make the parking deck a real landmark in town. The first night they were operational, the president of the hospital was getting calls from people in the hospital and others in town saying it was really neat that the colors changed.” – Michael Marz, GPD Group. When the new adjacent children’s critical care tower opens in May, patients in common areas and those with a window view from their rooms will be given iPads with controls to change the color of the panels as they see fit, creating an interactive mural of light visible to all. Free spanning from floor to floor, most of the panels are one continuous length, providing a seamless, flush look around the four-sided parking structure. Specified in ice white, the single-panel system was installed in two custom sizes: 50ft tall by 12ft long and 32ft tall by 12ft long. Featuring CPI Daylight’s Nano-Cell technology, which promotes long-term resistance to impact and wind loading due to its small cell structure and tightly spaced rib supports, the panels are made with an internal flexibility that absorbs thermal expansion across the panel in all directions. Most significantly, the panels offer light-diffusion capabilities that ensure excellent quality of natural light. They are 100% recyclable, making them ideal for any LEED project, and are made with heavy-duty co-extruded UV protection. Akron Children’s Hospital during the day, with the LEDs off. Due to the collaborative nature of the design-build project at the hospital, the architects and contractors worked closely with CPI Daylighting. “The hospital wanted to know that the installation would look right, so CPI sent out panels and we did a full-scale mock-up on the floor before we installed them.” said Marz. 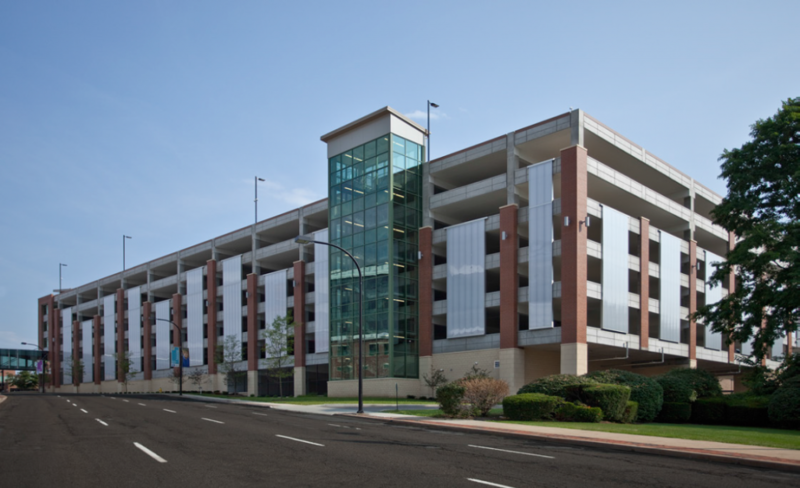 Built to serve multiple hospital facilities, the parking garage has become a local attraction. Evidence-based design teams determine that light and color effect healing. Evidence based design has determined from studies that color and light do shorten healing time. Natural light aids healing including reducing pain medications needed by 22%. Check out the video link below for more information.